Interviewer: What day did you go out on your ride? Barbara: My most recent ride with Windwalker Expeditions was on May 17th of 2012. I was in Phoenix that week to catch the Roger Waters "The Wall" concert with my oldest son. We had moved back to British Columbia, Canada in 2011, after living in Arizona for ten years. During that ten years, I was fortunate to find Windwalker, and when the plans for the concert were being made, one of the "other" things on my "must do" list was to go for a horseback ride in the desert with Windwalker. are very athletic, and Jasper is no exception. It seems he can canter "forever". Interviewer: Who was your guide? What was your impression of your guide? Barbara: My guide on this ride was Milton Joseph, and my horse was Jasper, a tall black Arabian who is wonderful to ride. All of the Windwalker horses that I have ridden are very athletic, and Jasper is no exception. It seems he can canter "forever". Joseph is very friendly and does all of the "work" of getting the horses ready. Joseph is knowledgeable in the vegetation and animals of the area, and always makes the ride interesting and fun. For example, this time he pointed out a prickly pear cactus growing near the top of a saguaro! Interviewer: What was your experience like? 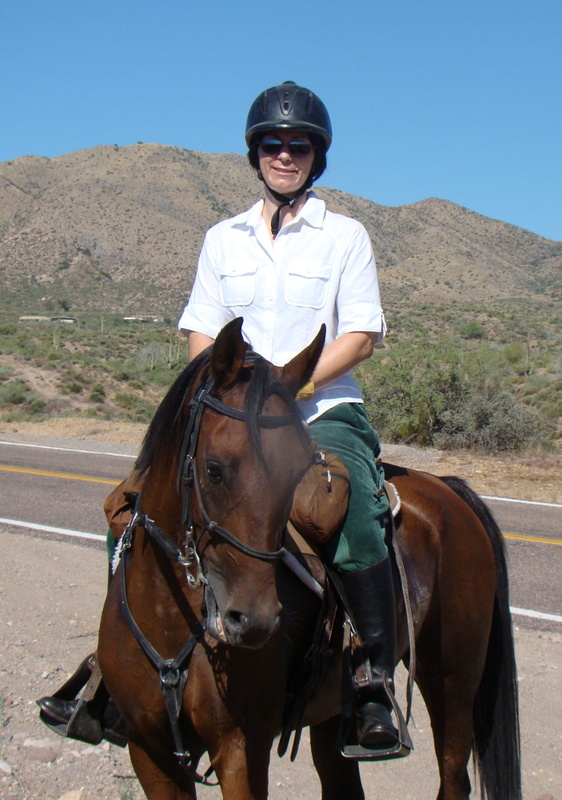 Barbara: Because of the season, and excessive midday temperatures (105F), I met Joseph in Cave Creek at 6:30 am and our ride started at 7, so that it wouldn't get too hot for the horses (and us). It was nice to see the sun rise and be out before there was too much traffic on the roads. The terrain was varied, with lots of hills and sandy washes, typical desert vegetation, some trees and even a bit of water. The horses were very skilled and sure-footed on the rocky trails.The vistas and views are incredible across the Tonto National Forest near Cave Creek. The only other people we saw were other horseback riders. The big city is not far away, but it feels like you could be hundreds of miles away. Interviewer: What were your favorite aspects of the ride? Barbara: My favorite part of riding is feeling connected with my horse. I have an English riding and jumping background going back to 1990, so am pleased that Windwalker offers English style saddles which are very comfortable and covered with a sheep skin which makes it even better. I have been on several rides with Windwalker and have never been disappointed.